Looking before you cross is no joke in this city. Cyclists WILL run you over before you can say ‘neem me niet kwalijk’ (excuse me). Bikes rule Amsterdam and cars are sparse. Considering that the Dutch are northern Europeans with business practices and highly regarded education systems similar to our own, it is interesting how some areas of their lives and of their culture are so vastly different than ours. Bikes instead of cars being one example. And their sidewalks leave you little room for safety; they are narrow enough for two tall, thin, dashing dutchmen. I kid you not with the dashing dutchmen comment. Ladies be warned: the dutch men are appallingly chic and handsome. Upon landing in Schiphol, I was swished into the city on a clean, comfortable, stark quiet (maddeningly, deafeningly quiet compared to the raucous, rowdy transportation of Italia) train filled with finely dressed commuters. Amsterdam houses all of its corporate centers and offices outside of the city, thus maintaining the center’s architecture and charm. This makes sense considering all of the waterways running through the city center. A looming tower of cubicles simply cannot be built amidst the footbridges and boats. Walking out of the train station, which was also spotless, one is faced with the most massive bicycle parking lot one has ever seen. Hundreds maybe thousands of bikes. Imagine the long term parking lot at JFK: this is Amsterdam’s version. After checking into my small hotel run by two male partners in their house, I wandered around the city with a few friends in search of an inexpensive dinner. We found that this does not exist in Amsterdam and also that most restaurants close down by nearly 9pm. It felt very quiet overall, and one friendly woman outside of a Thai restaurant said that everyone eats dinner very early, especially on a Monday. My first impressions of the neighborhood we were wandering in, which I came to find out were the 9 streets and its borders, were beyond charming and were dotted with upscale boutiques. I couldn’t wait to return to this neighborhood in the morning. I woke up at 8 the next day and set out for daylight exploration. Seeing everyone racing past me on their bikes was a sight to be seen. 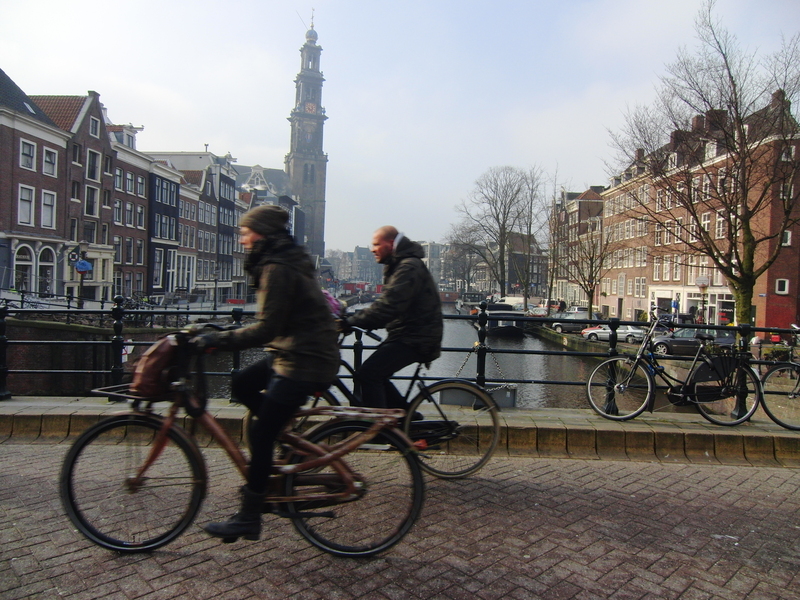 The commitment to their bikes as their main mode of transportation is mind blowing considering how cold and windy the canals are. I walked in circles around the 9 streets and stopped to have a delicious lentil soup at a crowded little cafe. I also ordered a glass (yes, a glass) of mint tea, as most everyone else in every cafe I had been in was drinking one. These are served in glasses with handles on them and a few sprigs of fresh mint. Their aroma is pure heaven and utterly relaxing when you are coming in from the frigid cold of this windy city. I returned to the adorable boutique-filled neighborhood I had found on the first night and was not disappointed. The Nine Streets are a destination for any shopper. 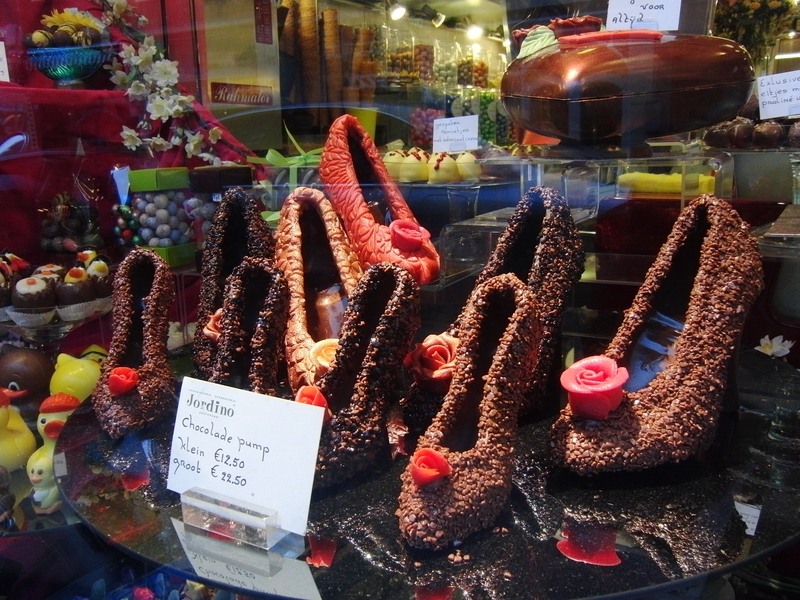 Independent jewelry stores, clothing stores of all styles, and small cafes are abundant. The streets are clean and full of character and locals. This is certainly not a touristy area. I walked around and around each block numerous times, just to make sure I didn’t miss anything. If you’re feeling weak after all that shopping, you won’t have to go very far for delicious, healthy lunch options or a strong cup of coffee. The Dutch are beautiful people- they have their own look and are very trendy in a downtown kind of way. And their enviable style is perfectly maintained on their rickety bikes. Compared to my other Europe trips, the people in Amsterdam reminded me most of New Yorkers, and the city felt the most current in comparison to Rome, Florence, and Prague. The people of Amsterdam reminded me of Soho, the East Village, or the Lower East Side- at least in areas like the nine streets. -They like mayo- a lot. -They drink a lot of mint tea.